Nadaah Jíí Shósh by Nani Chacon. On the Navajo Reservation for the Painted Desert Project. 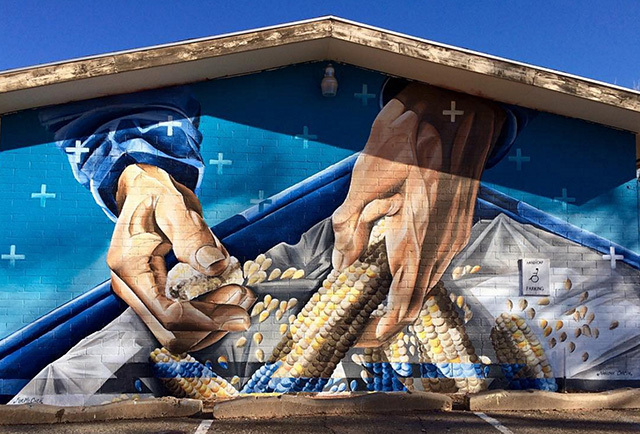 Mural created in honor of her grandfather, as he prepares corn for grinding. Photo by Chip Thomas. Thanks in part to encouragement from public artists of color like Lunar New Year, jetsonorama and Mata Ruda, I persisted. The more murals I painted, the more I found myself in the position of being the only (or nearly only) woman of color public artists at a mural festival, panel, or public art party. 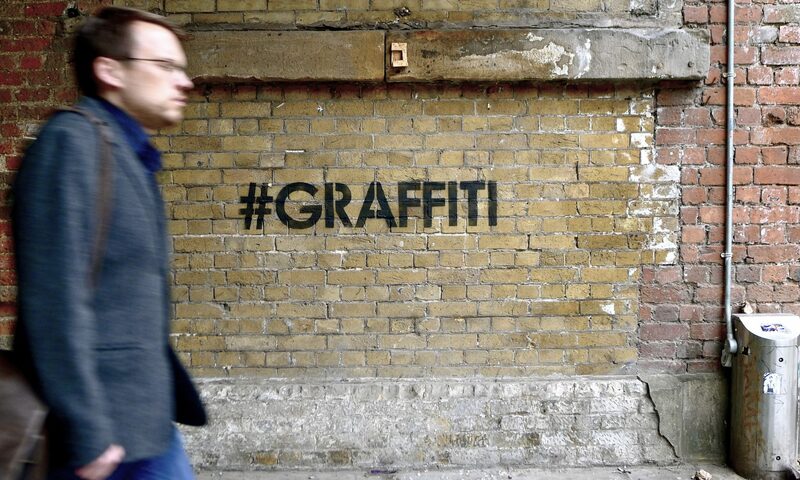 When our stories and portraits are visible on walls at all, it’s primarily through the work of male street artists. 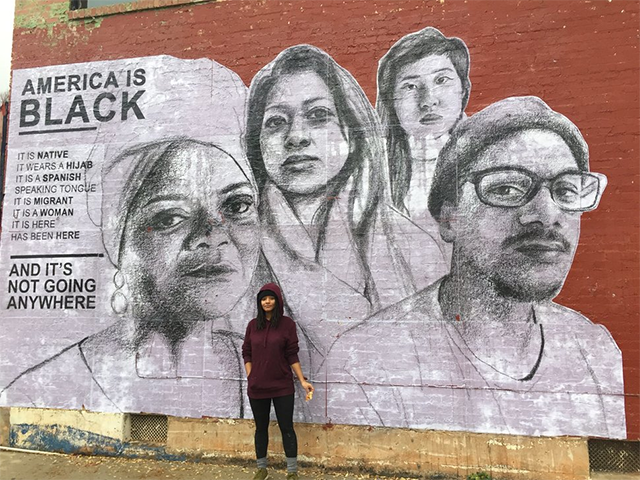 As women hold together neighborhoods that their own families are being pushed out of, put emotional labor into healing projects and youth education, and generally hold this country together, our neighborhoods become filled with murals painted by white men outside of our communities. How do we shift this historically patriarchal narrative? Can we use public walls as a tool uplift the voices of women of color who are constantly told they have to silence their voice? Moreover, can young girls be invited to envision a future for themselves and take part in painting it on the walls of their own neighborhoods? Tatyana Fazlalizadeh. In Oklahoma City. Photo from Tatyana Fazlalizadeh / The Huffington Post. Despite my fears, I am glad that I continue to pursue muralism because it has enabled me to take up and share public spaces with young girls. 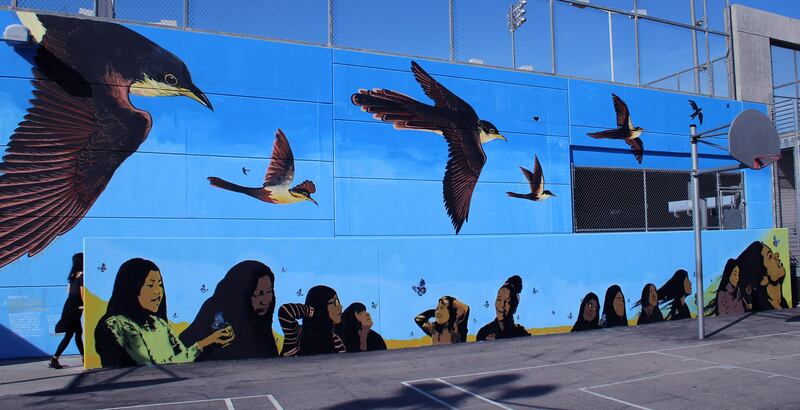 In Los Angeles, I worked with fifteen high school-aged migrant girls–to spray paint their own faces permanently on a two-story wall in their high school in downtown Los Angeles. Beneath the flight of the yellow-billed cuckoo, an endangered species of bird that has been migrating from Latin America to California, the faces of the girls formed a mountainside of portraits. By the end of the mural, the girls were able to speak about about their own migration journeys with confidence and took ownership of the mark they left on their school. 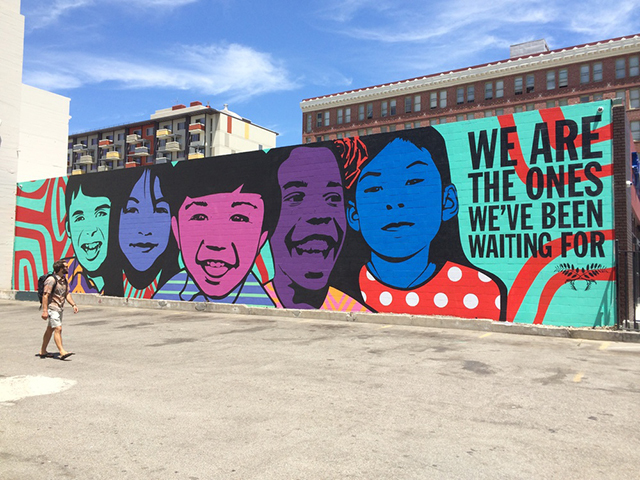 When this world has very few spaces to support healing for young girls, migrants, and their loved ones who cannot be visited, community mural projects can turn public space into an intimate haven of personal healing. We Will Always Have Wings by Jess X. Snow, Tani Ikeda, Thea Ulrich and 15 High School Girls: Karen Diaz, Cindy Francisco, Jennifer Gonzalez, Lesly Gonzalez-Renoj, Kenia Lopez-Chavez, Linda Lozano, Laura Pastor-Lopez, Daisy Perez-Chavez, Brenda Rivas, Daniela Rosales, Elizabeth Sanchez, Lizbeth Sanchez-Lopez, Mariso Valentin Escobar, Jacqueline Marybeth Rauls, Nina Lee, Alexa Strabuk, Natascha Heckers, Thaynara Fernandes de Silva. In Los Angeles, CA. Photo by Roger Peet. When art school and institutions did not give me the tools to believe in the power of my own voice, the community of artists of color that I found did. We may be few, but this world needs our voices. 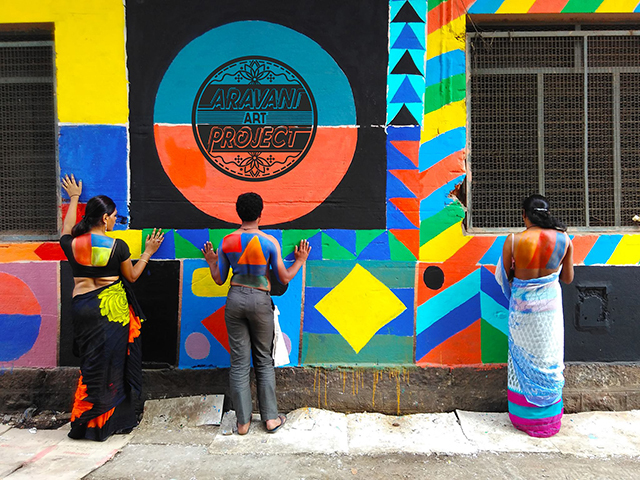 I honor the work of the Aravani Art Project, a mural project headed by muralist, Poornima Sukumar in Bangalore, India where local trans women are invited to paint murals that uplift their own community. I honor the work of Tatyana Fazlalizadeh, a Brooklyn-based Black woman artist who uses public art as a tool to speak back against the street harassment that women, queer and trans people face. I honor the work of Nani Chacon, a Diné (Navajo) and Chicana woman artist who illuminates the resilience of her communities in the Southwest while working directly with youth apprentices and young girls. I honor the work of Jessica Sabogal, a Colombian muralist based in Oakland whose murals serve as a haven, a tribute, and a creative outlet of adoration and exaltation for women. Most of all, I honor the work of all the unnamed women and trans people of color who have journeyed into the realm of taking up public space, but have had to do it illegally or anonymously. Our stories of diaspora, struggle, motherhood, queer liberation, and love are worthy of thousands of murals. The Aravani Art Project an ongoing community mural project for trans women in Bangalore, India. Photo by Special Arrangement. I call for those with access to give more public walls to women of color artists and trans artists, and not just as tokenism to diversify mostly-white mural programs–but to create queer-friendly, diverse and socially-conscious spaces that feel more welcoming for us. I call for art education spaces to bring young girls a diversity of women artist mentors that can empower them to envision the world they dream of living in. If the art world cannot imagine a reality where women and queer and trans people of color are making artwork on a monumental level, then we must work together to create a world where we are. A mural is a portal into a future that does not exist yet. A portal that passerby of all ages and genders can encounter by accident on a stroll through their neighborhood. 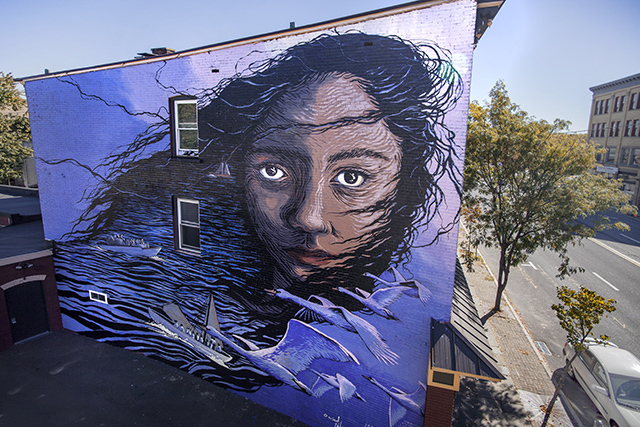 Public art and women and trans-led community mural projects that unveil our stories on a monumental scale have the power to inspire the next generation of girls to grow up without the fear that has silenced so many women before them. Women and women-identified artists and trans artists dreaming of making art on the public scale, I am here to tell you: this world needs you. All of our victories are tied to each other. And when we triumph, it is no ripple. It is a tsunami. We Are The Ones We’ve Been Waiting For by Jessica Sabogal. In Oakland, CA. Photo from Jessica Sabogal’s website. Photos by Jess X Snow, Chip Thomas, Roger Peet, and Special Arrangement, and from Tatyana Fazlalizadeh / The Huffington Post, and Jessica Sabogal.